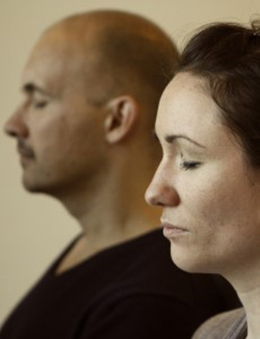 The meditation sound may be repeated in different ways. It may be clear and distinct or light and more fluid. The body and breath may be more or less involved. A young woman was in doubt about how to repeat the sound. Her uncertainty might reflect her relationship to herself and her life. At a guidance seminar in Acem, a young woman asked about the repetition of the meditation sound. 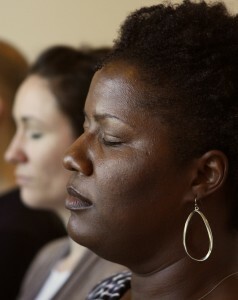 When she first learned to meditate she found the method simple and easy, but now she was in doubt. Would it be better to involve muscles and the tongue in the repetition of the sound, almost as if she were saying it aloud? Or would it be better merely to think the sound in her mind, without trying to make it distinct? The former solution made her more confident that she was repeating the sound correctly, whereas she found the latter more relaxing. I didn’t know the woman, but the few words she said during the seminar gave an impression of who she was. It’s easy to identify with her dilemma. She is not alone in experiencing the pull between two opposite ways of repeating the sound – a light, but fleeting one, and one that is distinct and clear, but implies a certain effort. During the weeks before the guidance seminar, the young woman had become aware of a choice she hadn’t noticed before. At the outset, it felt quite natural to involve the speech organs in the repetition of the sound. Now, however, she was able to repeat the sound more gently in her mind, without involving tongue or throat. This was a subtler way of meditating, but it came at the price of increased uncertainty. Was it really the meditation sound she was repeating? And what should she do when the sound was so indistinct that it was all too easily swept away by her thoughts? She wavered between the two ways of repeating the sound without being able to decide which was better. The woman’s dilemma reflects different ways of using our attention. When the meditation sound is distinctly articulated, our attention has a strong focus, and the contrast to thoughts passing in the periphery is obvious. At work and in other demanding situations we undoubtedly benefit from a clear focus on tasks and goals. When the woman learned to meditate, she found it natural to bring with her the same way of functioning into her meditation. When the sound is repeated lightly in the mind without involving the speech organs, the focus of our attention becomes more fluid, and the contrast with thoughts passing in the periphery of the mind is nearly blotted out. This was what was currently happening in the woman’s meditation. It gave more freedom to the impulses at the fringes of her consciousness, and brought her closer to the unconscious. But it required that she let go of her habitual sense of safety. The guidance seminar helped her articulate the contrast between heavy-handed and lighter uses of her attention. This, and the responses she got, clearly gave her a positive experience. When she first started to talk, she had seemed insecure and fumbling, but as she spoke, a certain calmness gradually set in. Something within her had begun to open up – like the feeling after a good and intimate conversation or an encounter with the silent beauty of nature. The woman’s dilemma also reflects different ways of using the senses, in this case the sense of hearing. Sensory impressions may be hard and insistent, or so light that they nearly disappear from consciousness. Both ways of listening have their rightful place in everyday life as well as in meditation, but the clear and hard way too often comes out on top, because uncertainty make us mobilize our defences. The meditation sound is not heard with the ears, only with the mind. But when the woman articulates the sound distinctly, she brings it closer to a physical way of hearing. This increases the feeling of clarity and certainty, but she remains on the surface, near the physical sensation of the body. The less involved the body is in the repetition of the sound, the more freedom the mind has to go deep. This also gives the woman’s mind an opportunity to take in a wider spectrum of impulses, not only in regard to sound, but also feelings. A life filled with too much familiar routine and monotony may easily stifle a spark that burns most intensely when there is little attempt to stay in control. The woman’s dilemma also reflects different ways of being present in her own life. When she repeats the sound in a nearly physical way, her presence is quite restricted, mainly involving the acting part of her, on which she focuses her attention. Her spontaneous impulses are at best perceived as irrelevant fringe activities on the outskirts of the mind. Meditation shows that a narrow sense of self is not only the result of external factors, but just as often of a personality that tends to hold on to the familiar instead of venturing into the unknown. When the repetition of the sound moves toward deeper and more subtle areas of the mind, the woman’s attention expands to include wider parts of her self. She becomes more sensitive. With that comes a richness and fullness that is absent when the narrow self dominates. But she may also encounter painful and confusing emotions that were previously kept at a distance. The fear of what an open mind might bring with it may be one of her reasons for sometimes wanting to stick to the safe and familiar way of repeating the sound. To be realistic, neither the woman nor the rest of us will be able to repeat the sound in a light and effortless way at all times. Striving to perform according to a certain norm or ideal easily yields the opposite result. We must accept that at times the meditation sound is closer to physical articulation than a fleeting thought in the mind. Phases of meditative ease are more like moments of grace, openings for new possibilities we can choose to grasp, or let pass almost unnoticed. We should maintain the habit of meditating daily, and sometimes put our doubts into words, like the young woman at the guidance seminar. Only then may we reach a point at which we recognize a certain hardness in our familiar way of meditating – and may begin to let the mind move in the direction of milder and fresher winds. Very interesting article! I really recognize myself in many of this woman´s relections on her meditation, especially when I was at a meditation retreat last week. ← And then we took Berlin!